A Boeing Delta 2 rocket added the final touches to Globalstar's orbiting armada of cellular telephone satellites on Tuesday, delivering the last four spacecraft into orbit. The $50 million booster blasted off from pad 17B at Florida's Cape Canaveral Air Force Station at 4:24 p.m. EST (2124 GMT). The launch, Boeing's first of 2000, occurred at the very end of the day's 30-minute window, a delay caused by thick clouds and precipitation around the Cape. Over an hour into the flight, the new satellites were released in two pairs as the Delta rocket passed south of Australia at altitude of 571 miles. Ground controllers in San Jose, Calif., established contact with the craft shortly thereafter. Plans call for one of the four satellites to be boosted out of its current parking orbit and into the operational Globalstar constellation in 11 to 12 days. The satellite will become the 48th and final primary satellite in Globalstar's fleet circling 879 miles above Earth. The other satellites, plus one from a previous launch, will act as on-orbit spares. They will be pressed into service when a primary satellite should fail. Globalstar is designed to provide wireless telephone, messaging and data transmissions to subscribers virtually anywhere on the planet using the orbiting satellites. "The completion of our constellation with this last launch is a remarkable achievement," said Bernard Schwartz, Globalstar chairman and chief executive officer. Tuesday's launch was the seventh Globalstar conducted using Boeing Delta 2 rockets, each lifting four satellites. Six Russian Soyuz rockets also launched four satellites each to deploy the constellation. "With the space segment successfully in place," Schwartz continued, "all of our energy and resources are directed toward the progressive roll-out of service around the world." Globalstar began a strategic service debut last October using a satellite constellation still in the assembly process. Full service is currently available in Mexico and Brazil, while efforts are underway elsewhere on the globe, said John Klineberg, president of Space Systems/Loral, founder of Globalstar. "We all tend to key on what is happening in North America and in Europe. 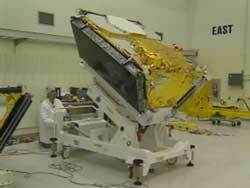 Those are less important to Globalstar than the other parts of the world," said Klineberg. "Critical areas for us are Brazil, Mexico, China and Russia because those phones are going to be used. When we sell phones in the U.S., they will be used once a week." "We are wholesaling the service (to local cellular service providers) and we get paid per minute of airtime," Klineberg explained. "The major importance for us is rolling out the service in areas where there really is no alternative." Of the 48 satellites placed into space prior to Tuesday's mission, none have suffered any major problems. "These are very good satellites," Klineberg said. "We feel very fortunate. We have seen no degradation mechanisms at all this time. There is high radiation and we do expect decreasing power, slowly, as the arrays get hit by atomic oxygen and other things." Engineers have expanded the satellites' expected lifetime from 7 1/2 to 10 years. The facility in Rome where the satellites were assembled has been closed temporarily, but officials plan to reopen the plant later this year to build eight additional spare craft. Two additional Boeing Delta 2 rockets have been purchased to launch the satellites to replace those that malfunction in space. The first launch is not expected before 2002, Klineberg said. "We actually thought we would launch those two Deltas as soon as the satellites were available," said Klineberg. "The first satellite should come out of the factory by the end of this year and we would have four early in the spring of next year. We were prepared to launch, at one point, at that date. (Globalstar) has rolled that back, probably six months, because they are so comfortable with the ones on-orbit and feel these four spares (launched Tuesday) will last us well beyond that time." "We are in an enviable position in not being pressed to fabricate those satellites and get them to the launch pad." Globalstar, led by founding partner Loral Space & Communications, is a partnership of other telecommunications service providers and equipment manufacturers, including co-founder Qualcomm Incorporated, Alenia, China Telecom, DACOM, DaimlerChrysler Aerospace, Elsacom, Hyundai, Qualcomm Incorporated, TE.SA.M (a France Telecom/Alcatel company), Space Systems/Loral, and Vodafone AirTouch. 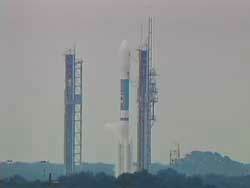 Launch preview - A story giving an overview of this rocket launch. Windows - Available windows for future launch dates. Orbit trace - Map showing the ground track the rocket will follow during flight. Delta 2 rocket - Overview of the Delta 2 7420 rocket used to launch the Globalstar satellites. 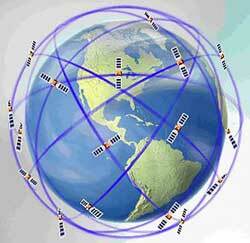 Globalstar system - Description of the Globalstar satellites and constellation. The Boeing Delta 2 rocket lifts off with the final four satellites for Globalstar's constellation. Animation shows the Boeing Delta 2 rocket launching four satellites for the Globalstar cellular telephone system. Boeing Mission Director Rich Murphy explains the launch process and trajectory the Delta 2 rocket will follow during flight. Space Systems/Loral President John Klineberg describes the Globalstar constellation's health and how Tuesday's launch will complete the network. John Klineberg explains why Globalstar decided to launch spare satellites into space for the constellation.